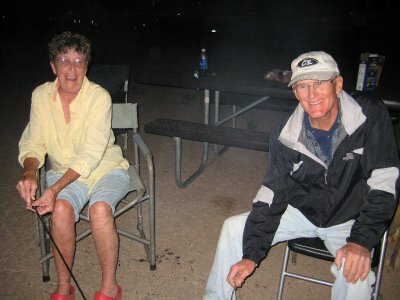 Barbara and Ron have been traveling together since 2005 when he sold his house and went on the road full time. 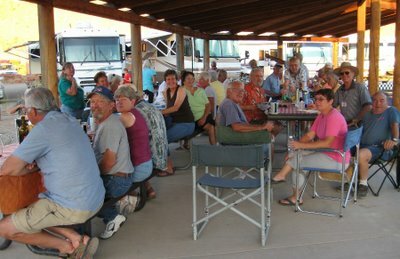 In 2006, I sold my fifth wheel in which I had been living since 2001 and moved in with Ron in his motorhome. Since then we have traveled throughout much of the US and some of Canada. 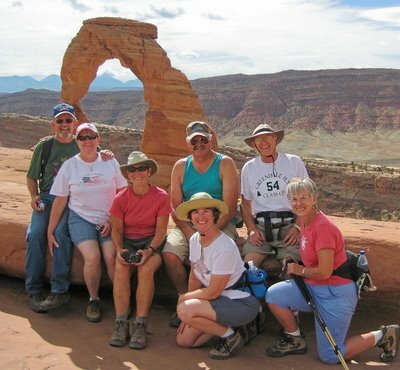 We met through our singles RV club WIN (Wandering Individuals Network) and sometimes travel with them or other friends. In 2009, we bought a house in Mesa, AZ, to use as our winter home. 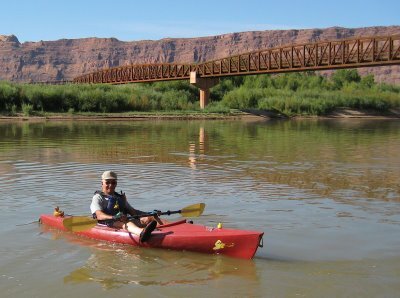 Last week while we were with the WINs here in Moab, we were so busy that I have to do another posting to catch up. 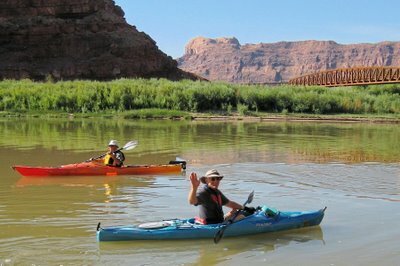 WIN gatherings can just be exhausting and the one in Moab was no exception. Here are a few more pictures from our time together. 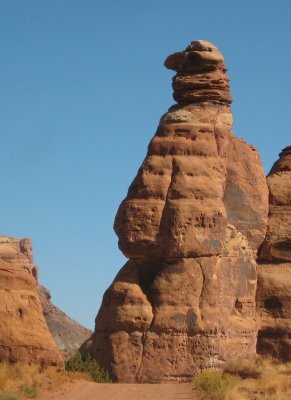 One day, some of us hiked up to Delicate Arch. 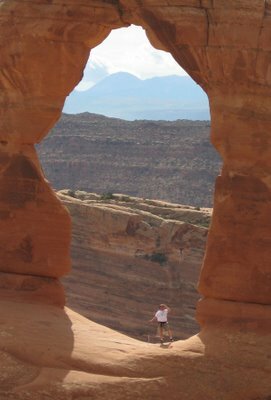 I know the arch is an evening shot, but we enjoyed the hike anyway. It was really windy, but at least that kept us from getting too hot. Pictured are (from left) Jack, Mary, Claudia, Bob, Ron, with Me and Dodie in the front. Ron did the ‘scare the children pose’ in the famous Utah landmark. 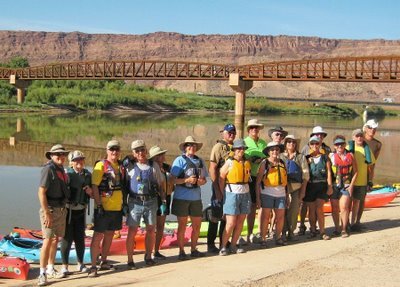 One day a lot of the group went kayaking on the Colorado. They paddled from about 10 miles upstream to our group campground. Here are Ron and I think that’s Bill in the back. Something tells me one of them is going the wrong way. And John is looking pretty comfortable with his feet up – does he think he’s in a recliner? One evening Brenda provided the fixings for s’mores – marshmallows, chocolate, and graham crackers. Yummy! Thanks Brenda. Joey and Ron look happy toasting their perfect marshmallows. 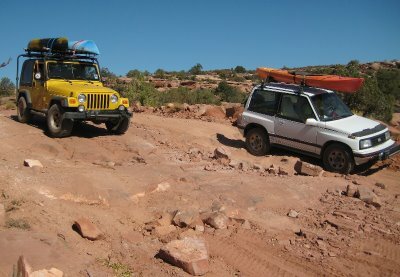 The group did a second 4-wheel drive trip. This time I rode with Max. Here he decided to go his own way down this rough spot. It was pretty exciting. We passed Gooney Bird Rock. I can see it! 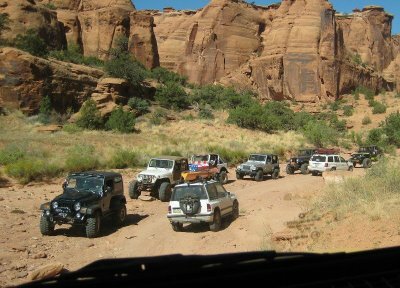 At one point, we passed a whole group of jeeps coming out. I noticed they all had bigger tires. John is talking about raising his Grand Cherokee four inches and getting bigger tires. I wonder how that will look? 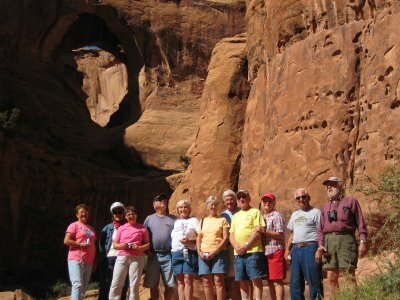 When we reached our destination, we all lined up for a group shot in front of Gemini Bridges (upper left of picture.) It’s a set of two bridges with about three feet between them. You can’t see it in this picture and when we went up top to look at it, I couldn’t get a good picture either. 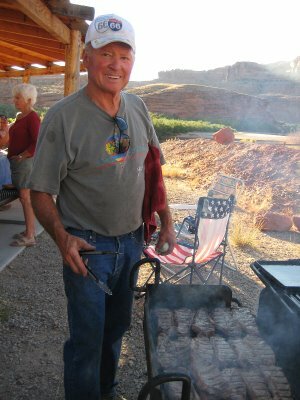 One evening, Bill cooked steaks for everybody – just look at all that meat on the grill. Bill’s a great cook and of course we all brought something to share. We had quite a crowd at the gathering and Kay did a great job as host.